Craving a steaming bowl of savory carbs? We can’t blame you. Thankfully, Las Vegas is no slouch when it comes to restaurants serving Asian-style noodle dishes. Slow-roasted bone broths. Delectable cuts of meat. Vibrant, farm-fresh vegetables. They’re all here in the mix. Get those chopsticks and soup spoons ready as we share some of our favorite Las Vegas ramen joints and noodle dens. It might come as a surprise to Las Vegas visitors, but there’s an impressive Chinatown just west of The Strip. While it’s a bit more spread out and suburban than other similar North American districts, Las Vegas’ Chinatown stands tall among culinary destinations specializing in Asian fare. One of the most notable—and animated— options in Las Vegas’ Chinatown is Chubby Cattle, where a conveyor belt delivers vegetables, proteins and noodles (made from unexpected ingredients like taro root) to diners, who then immerse the goodies in mini-cauldrons of roiling broth seasoned to taste. For Japanese-style ramen, famed Monta draws crowds of noodle-lovers to Chinatown for its delectable pork broth. Recently opened Ramen Hashi specializes in chicken-based consommé. Marugame Monzo dishes up thicker, soba-style pasta, filling bowls with hand-pulled threads and tempura-style crispy additions like soft-poached eggs and shrimp. Gourmet-level mainland Chinese noodle dishes are found at Niu-Gu, including a zippy lemon-pepper beef bowl. And if your palate can handle the heat, try Miàn Sichuan Noodle, which spices things up with chili-laden noodle dishes, including a delicious cold selection. South of Chinatown along Rainbow Boulevard is a growing thoroughfare of Asian restaurants with a noodle focus. Watch cooks pull fresh-made wheat dough into skeins of pasta at The Noodle Man. With quick flicks of a knife, the strands fly into a boiling cauldron of water before joining ingredients like beef brisket and black fungus. Further down the road, YuXiang features a mash-up of Korean and Northern Chinese recipes, including samson gan jjajang, which arrives as thick wheat noodles with a side of pork and vegetables in a black bean sauce. If “umami” is your culinary password, then Momofuku in The Cosmopolitan of Las Vegas is your home base. Even though this David Chang-helmed restaurant is known for its over-the-top, large-format creations, the menu is highlighted by several noodle dishes, including black truffle ramen with egg yolk, chickpea miso and chives, and a ginger scallion bowl with pickled shiitake mushrooms, cucumber and wakame (a seaweed kiss of the sea). There’s even a chilled spicy noodle bowl featuring savory sausage, Thai basil and candied cashews for a touch of sweetness. Just a short stroll from Momofuku inside The Cosmopolitan is China Poblano, where Chef José Andrés gives Szechuan dan dan noodles a spicy Central American kick with pequin chilies and aromatic cilantro, accompanied by piquant black Chinkiang rice vinegar. 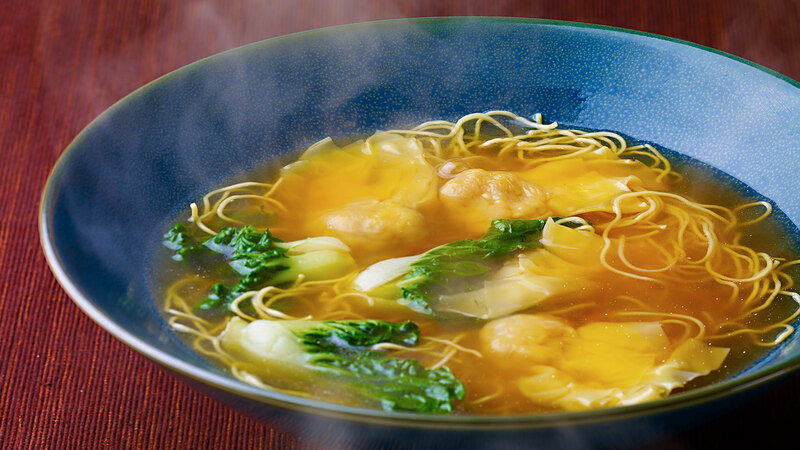 Other noodle-rific selections include the playfully named Swallow a Cloud, a rich soup featuring house-made shrimp and pork wontons mingling with egg noodles and bok choy. Pair any of these dishes with the China Poblano Cocktail Experience, a flight of four handcrafted cocktails inspired by Chinese and Mexican cultures. Las Vegas has become a hotspot for Vietnamese dining, especially at two sister restaurants: District One Kitchen & Bar in Chinatown and Le Phở in Downtown. District One serves an eye-popping, deluxe phở bowl featuring traditional rice noodles and a whole Maine lobster in its shell; Le Phở specializes in five spice-braised duck with egg noodles. Thai pad combos reach gourmet heights at both Chinatown’s Chada Thai and Downtown’s Le Thai.